The front of the drawer housing consists of rails (horizontal members) and stiles (vertical members). These are the finished front of the drawer housing and also accommodate the drawers. A diagram of the rails and stiles is shown in Figure 12. It is very important that all of the stiles and rails are installed exactly square, or your drawers will not fit properly. Cut four rails (S) from 1x4 pine, each 35 inches long. 1 x 4 pine, each 7-1/2 inches long. Cut three lower stiles (U) from 1x4 pine, each 8-1/2 inches long. Attach the four rails (S) to the front of the completed housing, paying particular attention to the spacing between them. 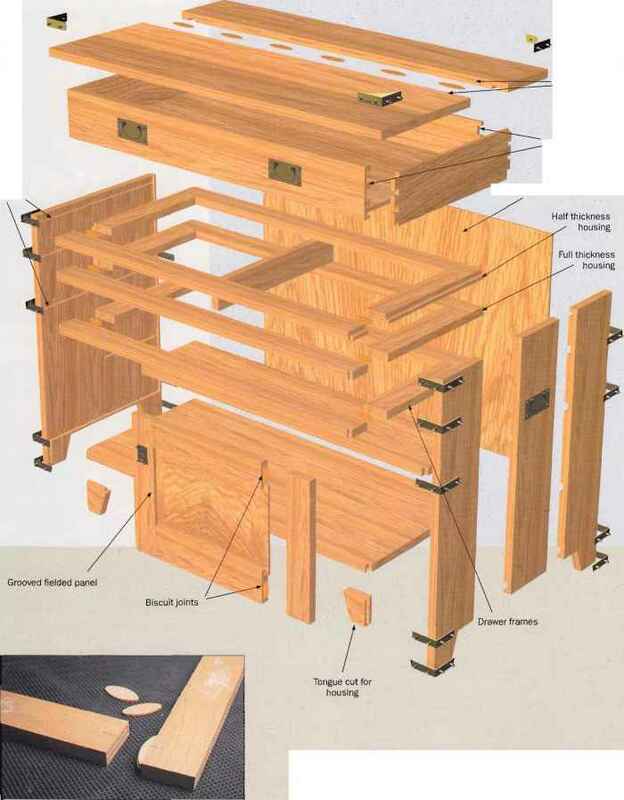 The four upper openings must be exactly 7-1/2 by 12-1/4 inches, and the lower two openings must be exactly 8-112 by 12-1/4 inches, as shown in Figure 12. All four of the rails (S) fit inside the exposed edges of the housing sides -p (M), top (L), and bottom (L). The rails cover the exposed edge of the center divider (P), leaving a 2-inch allowance at the front. Glue and ^ screw them in place with 2-inch-long screws, screwing through the rails (S) into the 2x2 pine supports. 7. Attach the three lower stiles (U) as shown in Figure 12. They also fit flush with the rails, and cover the exposed edge of the center divider (P). Glue and screw them in place, screwing through the lower stiles (T) and into the center divider (P) or the side supports (R). Toenail each of them to the rails (S) above and below.